Commission Regulation (EEC) No 752/93 of 30 March 1993 laying down provisions for the implementation of Council Regulation (EEC) No 3911/92 on the export of cultural goods (2) has been substantially amended several times (3). In the interests of clarity and rationality the said Regulation should be codified. Provisions are required for the implementation of Regulation (EC) No 116/2009, which provides, inter alia, for the establishment of an export licensing system for certain categories of cultural goods listed in Annex I to that Regulation. In order to ensure that the export licences provided for by the said Regulation are uniform, rules governing the drawing up, issuing and use of the form are necessary. To that end a specimen licence should be made available. In order to eliminate unnecessary administrative work, a concept of open licences for the temporary export of cultural goods by responsible persons or organisations for use and/or for exhibition in third countries is required. Member States that wish to take advantage of such facilities should be able to do so in relation to their own cultural goods, persons and organisations. The conditions to be fulfilled will differ from Member State to Member State. The Member States should be able to opt for the use of open licences or not and lay down the conditions to be met for their issue. Export licences should be made out in one of the official languages of the Union. 2. The use of export licences shall in no way affect obligations connected with export formalities or related documents. 3. Export licence forms shall be provided on request by the competent authority or authorities referred to in Article 2(2) of Regulation (EC) No 116/2009. 1. A standard licence shall normally be used for each export subject to Regulation (EC) No 116/2009. However, each individual Member State concerned may decide whether or not it wishes to issue any specific or general open licences which may be used instead if the specific conditions relating to them are fulfilled as set out in Articles 10 and 13. 2. A specific open licence shall cover the repeated temporary export of a specific cultural good by a particular person or organisation as set out in Article 10. 3. A general open licence shall cover any temporary export of any of those cultural goods that form part of the permanent collection of a museum or other institution, as set out in Article 13. 4. A Member State may revoke any specific or general open licence at any time if the conditions under which it was issued are no longer met. It shall inform the Commission immediately if the licence issued is not recovered and could be used irregularly. The Commission shall immediately inform the other Member States. 5. Member States may introduce whatever reasonable measures they deem necessary in their national territory to monitor the use of their own open licences. 1. Standard licences shall be issued on the form, a model of which is set out in Annex I. The form shall be printed on white paper without mechanical pulp, dressed for writing purposes and weighing not less than 55 g/m2. 2. Forms shall measure 210 × 297 mm. 3. Forms shall be produced in printed or electronic form and filled out in an official language of the Union designated by the competent authorities of the issuing Member State. The competent authorities of the Member State in which the form is presented may ask for it to be translated into the language, or one of the official languages, of that Member State. In this case, the translation costs shall be met by the licence holder. for taking any measure necessary in order to avoid the forging of forms. The means of identification adopted by Member States for this purpose shall be notified to the Commission, for communication to the competent authorities of the other Member States. 5. Forms shall preferably be filled in by mechanical or electronic means. However, the application may be filled in legibly by hand; in the latter case it shall be written in ink and in block capitals. Whatever the process used, forms shall not contain erasures, overwritten words or other alterations. 1. Without prejudice to paragraph 3, a separate export licence shall be issued for each consignment of cultural goods. 2. For the purposes of paragraph 1, a consignment shall mean either a single cultural object or a number of cultural objects. 3. Where a consignment consists of a number of cultural objects, it is for the competent authorities to determine whether one or several export licences should be issued for the consignment in question. one sheet, marked as No 3, which shall be returned to the issuing authority. 1. The applicant shall complete boxes 1, 3, 6 to 21, 24 and, if necessary, 25 of the application and the other sheets, except where pre-printing of the box or boxes is authorised. However, Member States may provide that only the application need be completed. a duly authenticated photograph or, where appropriate and at the discretion of the competent authorities, photographs in black and white or in colour (measuring at least 8 cm by 12 cm) of the cultural goods in question. This requirement may be replaced, where appropriate and at the discretion of the competent authorities, by a detailed list of the cultural goods. 3. The competent authorities may require, for the purposes of issuing an export licence, the physical presentation of the cultural goods to be exported. 4. Any costs incurred by the application of paragraphs 2 and 3 shall be met by the applicant requesting the export licence. 5. In order that an export licence may be granted, the duly completed form shall be presented to the competent authorities designated by the Member States pursuant to Article 2(2) of Regulation (EC) No 116/2009. When the authority has granted the export licence, sheet 1 shall be kept by that authority and the remaining sheets shall be returned to the holder of the export licence or to his authorised representative. the sheet to be returned to the issuing authority. 1. 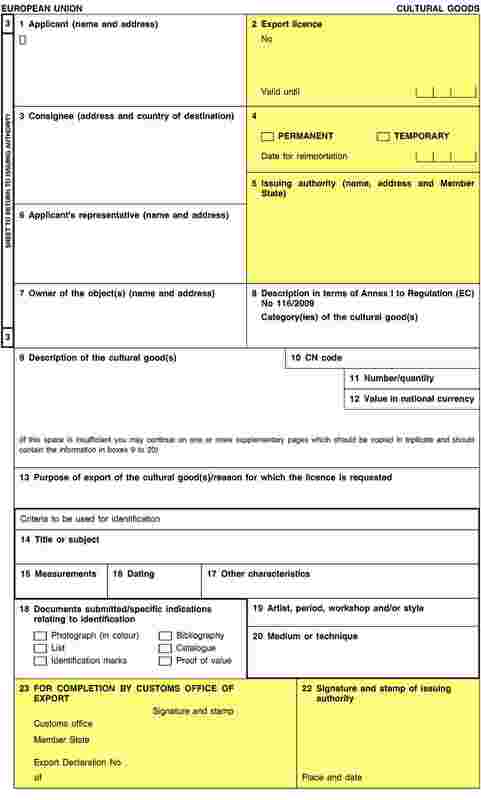 The customs office responsible for handling the export declaration shall ensure that the entries on the export declaration or, if applicable, the ATA carnet, correspond to the entries on the export licence and that a reference to the export licence is entered in box 44 of the export declaration or on the counterfoil of the ATA carnet. It shall take suitable measures for identification purposes. The measures may consist in the affixation of a seal or stamp of the customs office. The sheet of the export licence form which is to be returned to the issuing authority shall be attached to copy 3 of the single administrative document. 2. After completing box 23 in sheets 2 and 3, the customs office authorised to accept the export declaration shall return to the declarant or to his/her authorised representative the sheet intended for the holder. 3. 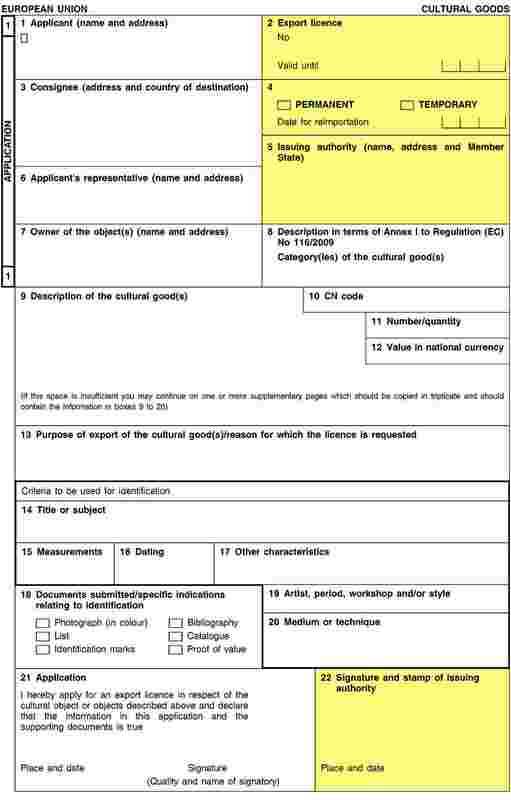 The sheet of the licence form which is to be returned to the issuing authority, must accompany the consignment to the customs office at the point of exit from the customs territory of the Union. The customs office shall affix its stamp to box 26 of the form and return it to the issuing authority. 1. The period of validity of export licences shall not exceed 12 months from the date of issue. 2. In the case of an application for temporary exportation, the competent authorities may specify the time limit within which the cultural goods must be reimported into the issuing Member State. 1. Specific open licences may be issued for a specific cultural good which is liable to be temporarily exported from the Union on a regular basis for use and/or exhibition in a third country. The cultural good must be owned by, or be in the legitimate possession of, the particular person or organisation that uses and/or exhibits the good. 2. A licence may only be issued provided the authorities are convinced that the person or organisation concerned offers all the guarantees considered necessary for the good to be returned in good condition to the Union and that the good can be so described or marked that there will be no doubt at the moment of temporary export that the good being exported is that described in the specific open licence. 3. A licence may not be valid for a period that exceeds five years. The licence shall be presented in support of a written export declaration or be available in other cases for production with the cultural goods for examination upon request. The competent authorities of the Member State in which the licence is presented may ask for it to be translated into the language, or one of the official languages, of that Member State. In that case, the translation costs shall be met by the licence holder. 1. The customs office authorised to accept the export declaration shall ensure that the goods presented are those described on the export licence and that a reference is made to that licence in box 44 of the export declaration if a written declaration is required. 2. If a written declaration is required then the licence must be attached to copy 3 of the single administrative document and accompany the good to the customs office at the point of exit from the customs territory of the Union. Where copy 3 of the single administrative document is made available to the exporter or his representative, the licence shall also be made available to him for use on a subsequent occasion. 1. General open licences may be issued to museums or other institutions to cover the temporary export of any of the goods that belong to their permanent collection that are liable to be temporarily exported from the Union on a regular basis for exhibition in a third country. 2. A licence may only be issued if the competent authorities are convinced that the institution offers all the guarantees considered necessary for the goods to be returned in good condition to the Union. The licence may be used to cover any combination of goods in the permanent collection at any one occasion of temporary export. It may be used to cover a series of different combinations of goods either consecutively or concurrently. The licence shall be presented in support of the export declaration. 1. The customs office authorised to accept the export declaration shall ensure that the licence is presented together with a list of the goods being exported and which are also described in the export declaration. The list shall be on the headed paper of the institution and each page shall be signed by one of the persons from the institution and named on the licence. Each page shall also be stamped with the stamp of the institution as placed on the licence. 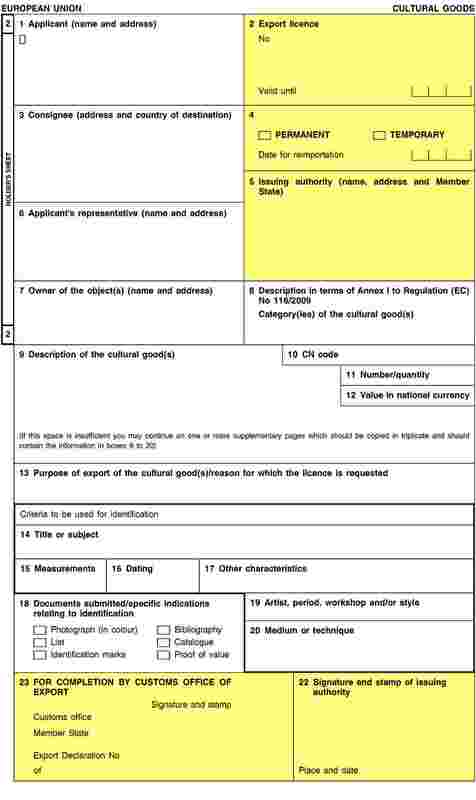 A reference to the licence must be made in box 44 of the export declaration. 2. The licence shall be attached to copy 3 of the single administrative document and must accompany the consignment to the customs office at the point of exit from the customs territory of the Union. Where copy 3 of the single administrative document is made available to the exporter or his representative the licence shall also be made available to him for use on a subsequent occasion. 1. Specific open licences shall be issued on the form, a model of which is set out in Annex II. 2. General open licences shall be issued on the form, a model of which is set out in Annex III. 3. The licence form shall be produced in printed or electronic form in one or more of the official languages of the Union. 4. The licence shall measure 210 × 297 mm. A tolerance of up to minus 5 mm or plus 8 mm in the length shall be allowed. The paper used shall be white, free of mechanical pulp, dressed for writing purposes and weigh at least 55 g/m2. It shall have a printed guilloche pattern background in light blue such as to reveal any falsification by mechanical or chemical means. 5. 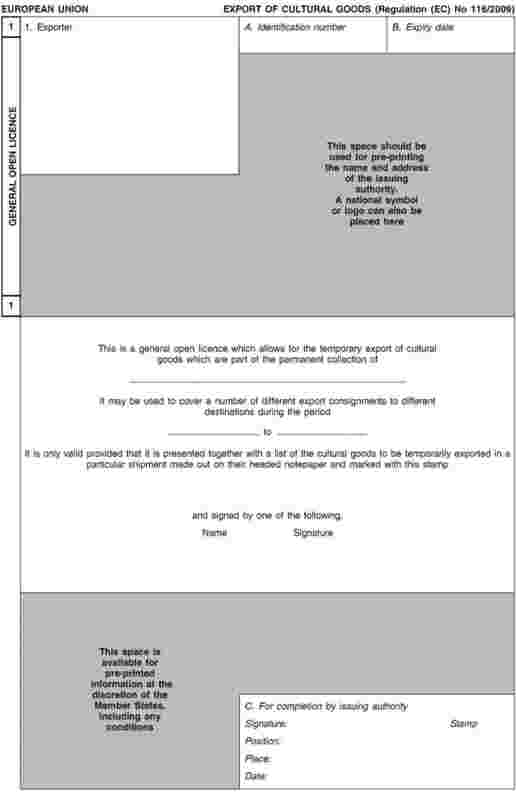 The second sheet of the licence, which shall not have a guilloche pattern background, is for the exporter’s own use or records only. The application form to be used shall be prescribed by the Member State concerned. 6. Member States may reserve the right to print the licence forms or may have them printed by approved printers. In the latter case, each form must bear a reference to such approval. Each form must bear the name and address of the printer or a mark by which the printer can be identified. It shall also bear a serial number, either printed or stamped, by which it can be identified. 7. Member States shall be responsible for taking any measure necessary in order to avoid the forging of licences. The means of identification adopted by Member States for this purpose shall be notified to the Commission, for communication to the competent authorities of the other Member States. 8. Licences shall be made out by mechanical or electronic means. In exceptional circumstances they may be made out by black ball point pen in block capitals. They shall not contain erasures, overwritten words or other alterations. Regulation (EEC) No 752/93 is repealed. Done at Brussels, 9 November 2012. (1) OJ L 39, 10.2.2009, p. 1. (2) OJ L 77, 31.3.1993, p. 24. Licences are required for the export of cultural goods to protect the cultural heritage of the Member States pursuant to Regulation (EC) No 116/2009. Implementing Regulation (EU) No 1081/2012 sets out the form in which standard export licences are to be drawn up. It is intended to guarantee standardised checks on the export of cultural goods outside the borders of the Union. general open licences, to be issued to museums or other institutions to cover the temporary export of any of the goods that belong to their permanent collections that are liable to be temporarily exported from the Union on a regular basis for exhibition in a third country. The three sheets of the standard export licence form must be completed legibly and indelibly, preferably by mechanical or electronic means. If they are handwritten, they must be completed in ink and in capital letters. They must under no circumstances contain erasures, overwritten words or other alterations. Any unused box must be lined crossed out so that nothing can be added. — Sheet No 3: to be presented at the competent customs office of export and to accompany the consignment thereafter until its arrival at the customs office of exit from the customs territory of the Union; the customs office of exit stamps this sheet and then returns it to the issuing authority. Applicant: Name of individual or company and full residential address or address of company headquarters. Export licence: For completion by competent authorities. Consignee: Name and full address of consignee, including the third country to which the good is being permanently or temporarily exported. Indicate whether export is permanent or temporary. Issuing authority: Name of the competent authority and the Member State issuing the authorisation. Applicant’s representative: To be completed only where the applicant is using an authorised representative. Owner of the object(s): Name and address. Description in terms of Annex I to Regulation (EC) No 116/2009. Category(ies) of cultural good(s): These goods are classified in categories numbered 1 to 15. Enter only the corresponding number. 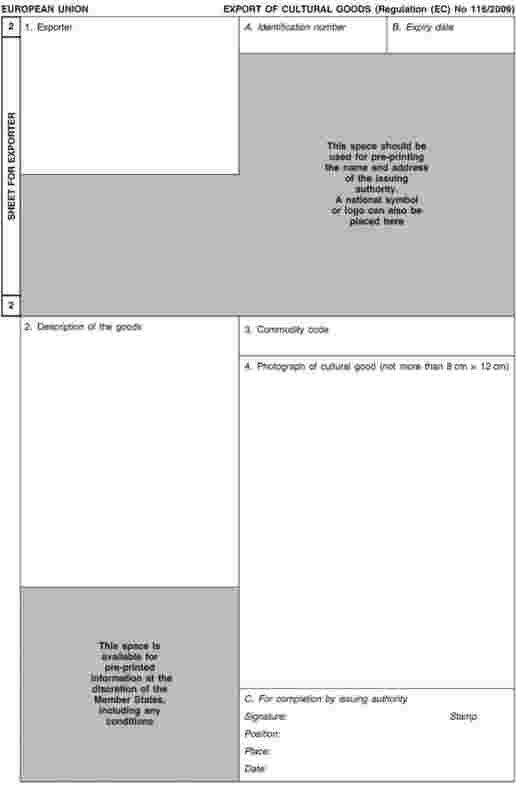 Description of the cultural good(s): State the exact nature of the good(s) (for example painting, sculpture, bas-relief, negative matrix or positive copy in the case of films, furniture or objects, musical instruments) and give an objective description of the appearance of the good(s). For category 13 objects: state the type of collection and/or geographical origin. For scientific collections and specimens: give the scientific name. For archaeological collections composed of a large number of objects: it is enough to give a generic description, which should be accompanied by an attestation or certificate issued by the scientific or archaeological body or institution and a list of the objects. 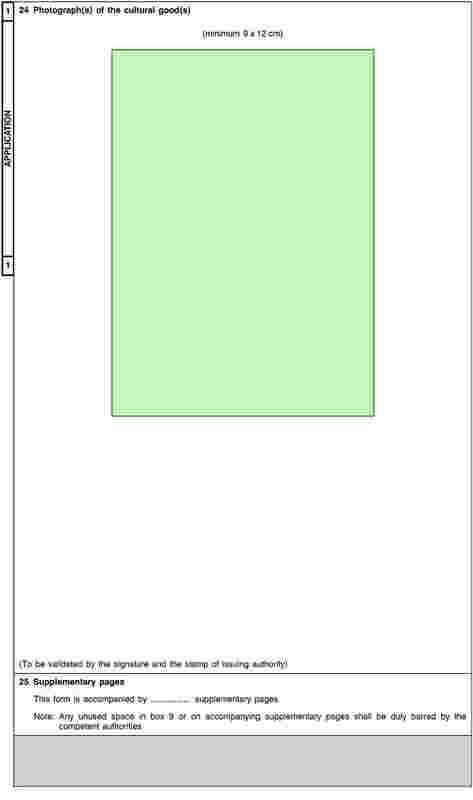 If there is not enough room to describe all the objects, the applicant must add any extra pages needed. CN code: As an indicator, state Combined Nomenclature code. Number/quantity: State the number of items, particularly where they form a set. In the case of films, indicate the number of reels, format and length. Value in national currency: State the value of the good(s) in national currency. Purpose of export of the cultural good(s)/reason for which the licence is requested: State whether the good to be exported has been sold or is intended to be sold, exhibited, valued, repaired or put to any other use, and whether its return is compulsory. Title or subject: If the work does not have an exact name, indicate its subject with a summary of the appearance of the object or, in the case of films, the subject. For scientific instruments or other objects for which it is not possible to specify a title or subject, it is sufficient to complete box 9. Measurements: Measurements (in centimetres) of the good(s) and any supports. In the case of complex or unusual shapes, indicate the measurements in this order: H × L × D (height, width, depth). Dating: Where no precise date is known, indicate the century and part of the century (first quarter, first half) or millennium (categories 1 to 7). For antique goods to which age specifications apply (more than 50 or 100 years old or between 50 and 100 years old), and for which it is not sufficient to indicate the century, specify a year, even if approximate (for example around 1890, approximately 1950). For films, if date not known, specify decade. In the case of sets (archives and libraries), indicate earliest and latest dates. Other characteristics: Give any other information on formal aspects that could be useful for identification, for example historical antecedents, conditions of execution, former owners, state of preservation and restoration, bibliography, electronic code or marking. 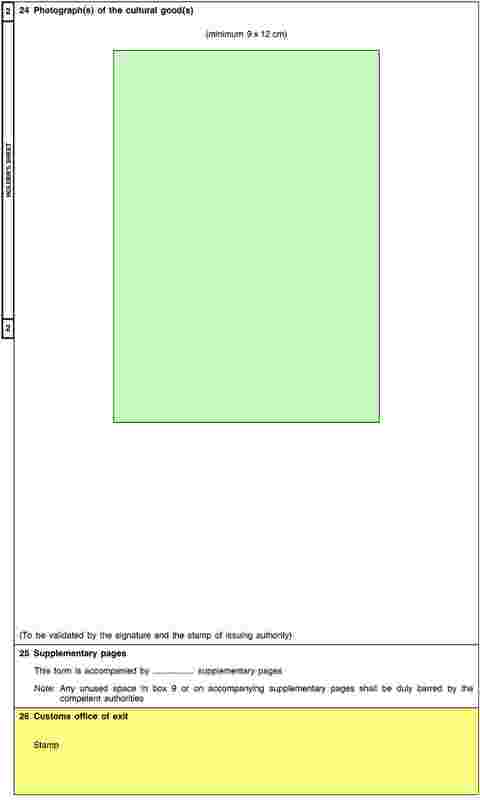 Documents submitted/specific indications relating to identification: Indicate with crosses in the appropriate squares. Artist, period, workshop and/or style: Give the artist’s name if known and recorded. If the works are collaborative products or copies, indicate the artists or the artist copied, if known. If the work is only attributed to a single artist, enter ‘Attributed to […]’. If the artist is not known, state the workshop, school or style (for example workshop of Velazquez, Venetian school, Ming period, Louis XV style or Victorian style). In the case of printed matter, state the name of the publisher, the place and the year of publication. Medium or technique: The information given in this box must be as precise as possible. Indicate the materials used and specify the technique employed (for example oil painting, woodcuts, charcoal or pencil drawing, lost wax casting, nitrate film, etc.). (sheet 1): Application: Must be completed by the applicant or his/her representative, who must vouch for the correctness of the information supplied in the application and supporting documents. Signature and stamp of issuing authority: To be entered by the competent authority, with place and date, on the three sheets of the licence. (sheets 2 and 3): For completion by customs office of export: To be entered by the customs office where the export transactions are carried out and the export licence is presented. ‘Customs office of export’ means the office where the export declaration is submitted and export formalities are carried out. Photograph(s) of the cultural good(s): A colour photograph (at least 9 × 12 cm) must be attached with glue. To facilitate the identification of three-dimensional objects, photographs may be required of the different facets. The competent authority must endorse the photograph with a signature and the stamp of the issuing authority. The competent authorities may require other photographs. Supplementary pages: State the number of additional pages used, if any. 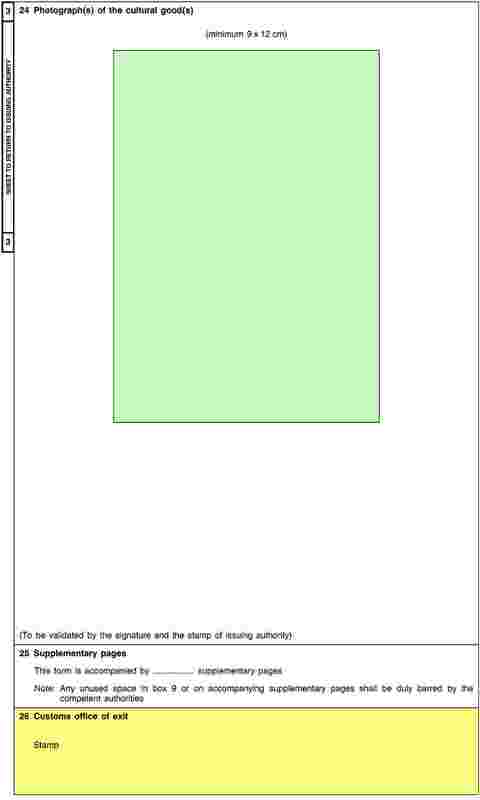 (sheets 2 and 3): Customs office of exit: To be completed by the customs office of exit. ‘Customs office of exit’ means the last customs office before the goods leave the customs territory of the Union.